Keith Farmer (33), race winner Jack Kennedy (4) and Andrew Irwin (8) battled it out all the way to the finish at Brands Hatch. Keith Farmer will be out to extend his advantage in the Dickies British Supersport Championship this weekend at Thruxton. 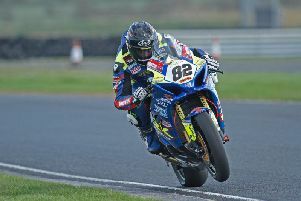 The Appleyard Macadam Racing rider is targeting a third British title after winning the Superstock 600 and 1000 crowns in successive seasons in 2011 and 2012. Farmer’s plans for 2017 were left up in the air as he struggled to secure a seat without having to fork out upwards of £45,000 to buy his way into a team, but he grabbed his chance to replace injury victim Luke Jones on the Macadam Yamaha and hasn’t looked back. The Clogher man clinched a victory and a runner-up finish last time out at Brands Hatch, opening a cushion of 26 points over Gearlink Kawasaki’s Andrew Irwin, and Farmer will be hoping to make his experience count in his bid to sew up another British championship. “We’ll try and be smart and I’ve got the experience of two titles behind me, so that should help us in the long run,” said Farmer, who was narrowly denied a double at Brands by Dublin’s Jack Kennedy, who out-dragged the Ulsterman to the line on the final lap. Kennedy is in contention in third place on the MV Agusta, now only seven points behind young Carrick prospect Irwin. The Sprint race takes place on Saturday at 5.20pm, with the Feature race on Sunday scheduled for 3.40pm. Meanwhile, in the MCE British Superbike Championship, Jordanstown’s Andy Reid will be competing in only his third meeting since replacing Davide Giugliano in the Moneymore-based Tyco BMW team. Reid made his full BSB debut at Snetterton last month and is gradually making the transition to the S1000RR after making the step up from the Supersport class. “Brands was only my second ever race meeting on the bike after my debut at Snetterton, but the TAS Racing BMW is already starting to feel like my own little baby,” said Reid. “There are lots of positive for me to take away and I’m just working through the plan set out for me by crew chief, Stuart Johnstone. Carrick’s Glenn Irwin will also be in action this weekend on the PBM Be Wiser Ducati. Irwin made his return at Brands after missing the previous two rounds of the championship following a crash in free practice at Knockhill, when he sustained serious injuries to his shoulder and elbow. Irwin has dropped out of the top ten in the standings as a result of his injury setback, but he hopes to build on his Brands comeback at Thruxton, where he claimed his maiden BSB podium in his rookie season in 2016. “At Brands Hatch, we ended race two content with points and just one second off Shakey’s fastest lap,” he said. Free practice gets underway at the Hampshire circuit on Friday.